Is gaining more Facebook fans one of your New Year’s Resolutions? 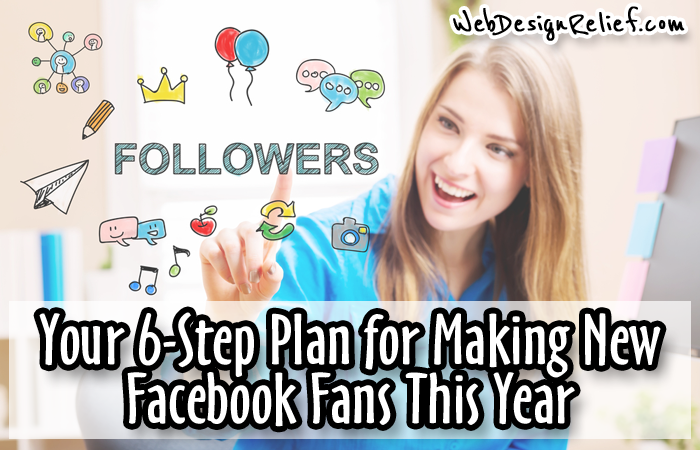 Whether you’re promoting your new book, starting to blog, or just beginning to explore the potential of Facebook for authors, our six-step plan will help you build your fan base in the new year! Step 1: Post appropriate content. Keep your author brand in mind and post updates on your Facebook Author Page that focus on your writing career: new publication credits, speaking engagements, conferences you’ve attended, even posts about what inspires you to write. Leave the personal posts to your personal profile. If you’re not sure whether something is “Author Page appropriate,” refer to the unofficial etiquette rules of Facebook. Step 2: Share photos. Studies show that photos on Facebook and other social media tend to do much better than basic text posts. Be sure to share some images, whether from your own archive or from other pages that you like. Check out our advanced photo sharing tips—your images may even go viral! Step 3: Integrate. Get your website and Facebook firing on all cylinders by cross-promoting. Your Facebook Author Page should be linked on your website, and your website should be featured on your Facebook page. Make sure the links are prominently placed so interested visitors can easily click and learn more about you and your writing. Step 4: Give away incentives. Everyone loves a freebie! Do you have a novel excerpt, a secret page, or other virtual goodies that can be made available only to your Facebook fans? Let your visitors know! If you’ve created a mailing list for your website subscribers, let them know where you’ve hidden this extra content on Facebook. Giving your fans a sneak peek into exclusive content can entice them to buy something from you in the future. Step 5: Advertise. Boosted posts? Promoted posts? Confused about the difference? If you’ve released a new book and you’re ready to get the word out, try advertising on Facebook, as well as other social media, to reach a wider audience. The high click-through rate could mean more visitors and more potential buyers. Step 6: Hire a consultant. If the idea of maintaining your Facebook page seems time-consuming and daunting, consider hiring a social media consultant to take over the reins of your social marketing. But be careful; know what you’re getting into—be sure you’re hiring a professional. Writer’s Relief’s Virtual Assistant Program offers excellent service tailored especially for writers. We can create a Facebook author page for you and update it multiple times per week with fresh, interesting content to keep visitors coming back for more. It’s a new year—take advantage of these new opportunities to build up your author brand…and your Facebook following! QUESTION: What steps will you be taking to increase your social media fans? Of course it would e helpful if I have a clue as to how face book works. Only two parts of it make any sense. “What’s on your mind.” and Notifications. I don’t even know where to start so this article is of little help, even when I DO get a self published book. Oh! does this apply to self published audio books? Rodney, try our other blog articles on Facebook tips here: http://www.webdesignrelief.com/category/social-media/facebook-tips/. You can also take a look at our Virtual Assistant Program for social media at this link: https://writersrelief.com/writers-relief-virtual-assistant-packages/.